"The higher this attribute, the closer you are to beasthood when temporary transformed". Your Beasthood stat determines the maximum strength of your Beast Transformation using Beast Blood Pellets or the Beast Claw's transformed mode. You won't literally transform into a beast, but raising the Beast Gauge will give you a serious increase in attack power, at the cost of a similarly serious decrease in defense. The higher your Beasthood is, the higher your maximum potential damage will be when using Beast Transformation. Beasthood can't be gained like normal stats. Instead, it is conferred by attire. Having high Insight also reduces your Beasthood, so make sure to spend all of your Insight if you want to maximize Beasthood. There are only three items that make use of this stat. These items cause character to enter into a state where he is given a meter above his head. This meter drains slowly, but will refill after each successive hit, and as it fills it increases both damage dealt, and damage taken. The Pellet gives you a temporary buff (60 seconds) that allows your attacks to fill Beasthood meter, while the Beast Claw will always increase Beasthood meter, regardless of if the buff from the Pellet is active or not. Note that the maximum level player can reach is limited by his character's Beasthood stat. Equipping certain attire will increase it and having high Insight decreases it. If you want to maximize the Beasthood, you will want to keep Insight at 0. Consider equipping the Ashen Hunter Garb - it has the highest Beasthood of any attire. Having a high maximum doesn't help if you can't fill your gauge, though. Attacks fill the gauge, but it automatically depletes over time. R1 attacks don't fill the gauge much; R2 attacks are generally better for this purpose. Multi-hit attacks also do well. 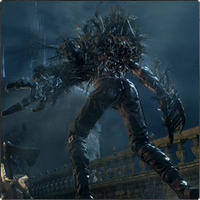 The best weapon in the game for filling the meter when using Beast Blood Pellets is Logarius' Wheel; the transformed mode's R2 attack fills the gauge very rapidly. The downside is that Beasthood only benefits physical attack power, while the Logarius' Wheel deals a lot of arcane damage. You can actually swap to another weapon after filling the gauge, though! You won't lose your Beasthood for swapping weapons if pellet is used. Combination of Beast Claw and Beast Blood Pellets isn't beneficial as the transformed state that enables you to increase your beast gauge does not stack with the pellet's effect. It is, however, worth using Radiant Gems to reduce the stamina costs of your attacks. The Anti-Clockwise Metamorphosis Rune to increase stamina also helps. The Beast Runes also augment your transformed state.